Following the successful and ongoing activities of FoodTechAfrica (FTA) to develop the value chain of farmed fish in Kenya and other East African countries, FTA will now join the ‘Kenya Market-led Aquaculture Program’ (KMAP) implemented by Farm Africa and funded by the Dutch Embassy in Kenya. The KMAP program will tackle issues of food security and depletion of fish stocks in Lake Victoria that currently supplies the vast majority of Kenya’s fish supplies. The 4 year program is designed to develop a vibrant aquaculture industry that generates sustainable incomes, food security and employment. The project is coordinated by lead partner Farm Africa and implemented in partnerships with WorldFish Center, PUM Senior Adivsors, Centre for Development Innovation (WUR), BoP Innovation Center and FoodTechAfrica. 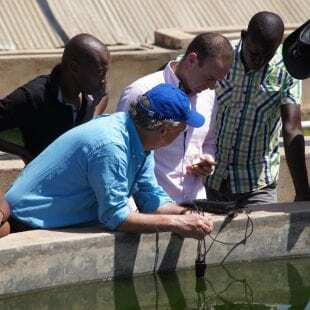 Within KMAP, the companies of FTA (Fishion, HollandAqua and Viqon) will develop a modular aerated fish farming kit that will be tested and demonstrated in the Kenyan context. Given the successful application of aerated fish farming in FTA’s pilot, aim within KMAP is to develop a modular system that is commercially viable for entrepreneurial farmers in Kenya. * FoodTechAfrica is a public private partnership managed by Larive International, that has been active in developing the value chain for fish farming in East Africa since 2013. As such, a pilot farm applying Dutch knowledge of aerated fish farming as well as a feed mill equipped with Dutch technology and knowledge are currently being established.